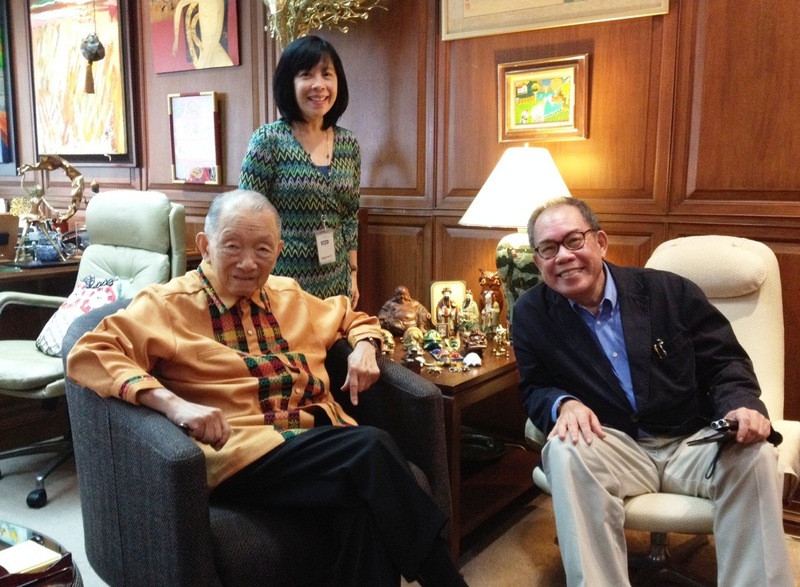 IT HAD been a few years since I last sat down for a chat with the accounting and business guru Washington SyCip, whose biography (Wash: Only a Bookkeeper, published in 2009) I had been privileged to write, so I was only too happy to oblige when our mutual friend Marlu Balmaceda asked if I could spend some time last week to shoot the breeze with Wash.
As cool and dapper as he is, Wash makes it look like he’s taken it easy all his life, but I know for a fact—having chronicled that life—that it just isn’t so. No slouch could’ve put up and sustained what became the regional accounting giant SGV. Seeing that illiteracy still afflicted millions of Filipinos, Wash resolved to do something about it and committed US$1 million of his own money to a fund aimed at the problem. Helping him along was his friend, the Armenian-American businessman and philanthropist Paul Kazarian, who pledged to match Wash’s contribution dollar for dollar. But even with that funding, Wash was modest and realistic enough to know that he couldn’t do the job by himself. “I don’t really know the poor, and how best to reach them,” he admits. “So I got in touch with CARD-MRI, which has been a leader in Philippine microfinance, to help us out.” Radiowealth Finance Corporation has also geared its CSR program toward the Zero Dropout scheme, and committed to provide P30 million. The Center for Agriculture and Development-Mutually Reinforcing Institutions or CARD-MRI goes all the way back to 1986 when Dr. Jaime Aristotle Alip and 14 other rural development practitioners got together to set up CARD specifically to help empower women in poor communities. In 2008, it received the Ramon Magsaysay Award for Public Service. “With over 1,400 units all over the country, CARD had a network in place we could tap for our program,” Wash says. As of March this year, the program had supported over 46,000 students through loans totaling over P160 million, out of which P130 million in principal and P6.5 million in interest has already been paid back. They expect to hit 100,000 beneficiaries by year’s end. While most beneficiaries come from Region IV-A (the Calabarzon area), the program has expanded to the ARMM in Mindanao, where the dropout rates are the highest. Typical beneficiaries include Lucena native Lilia Fernandez, a mother of nine who works as a manicurist alongside her husband, a construction worker; her son Erick dreams of becoming an engineer. Unlike the government’s conditional cash transfer program, which gives cash direct to poor beneficiaries, Zero Dropout is a loan program. “They repay the loan through microfinance, by increasing their income with a loan for a store, a tricycle, and so on,” adds Wash. I came away most impressed by an incident that Wash related: “When Yolanda hit, 8,000 students under the program were affected in Leyte and other places. My first reaction was to cancel their loans, as the least we could do to help. But Dr. Alip said, Wash, no—the poor are more honest than the rich. And as reconstruction took off, the loans also began to be repaid, even if the borrowers had lost their homes.” If that’s not inspiring—in the context of billions lost to crooks and scammers—I don’t know what is. I ALSO collect old watches, and this is one of them, a Waltham Traveler pocket watch from around 1927. This picture is my wallpaper on my iPhone. 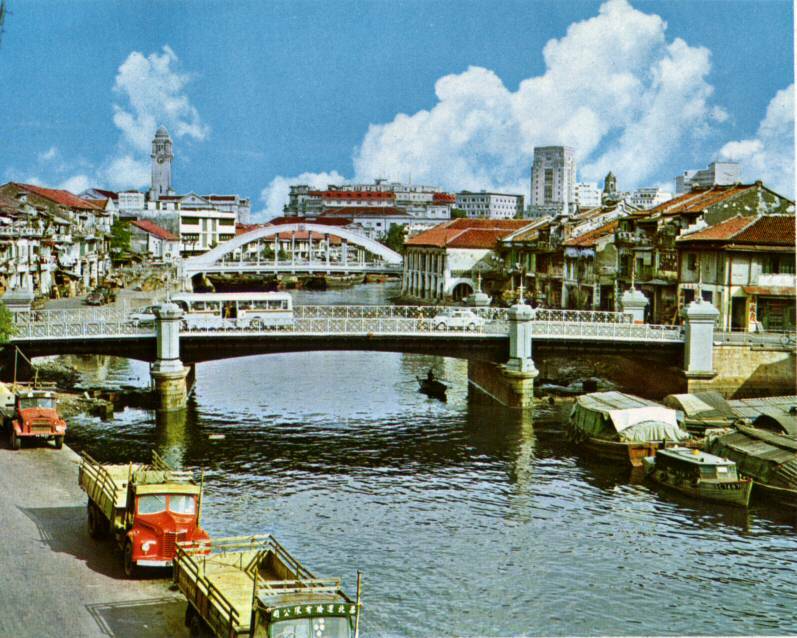 LAST WEEK, I wrote a piece extolling the emergence of dissident themes and voices in Singaporean literature, particularly in the novel The River’s Song by Suchen Christine Lim, who reminded us how much of that city-state’s wealth and power grew on the back of its underclass. I’m sure that there are many voices harsher and more strident than Suchen’s among Singapore’s younger writers, which is good. We’ve long expected this kind of literary insurgency to happen, as it is almost invariably the writers of any nation who form the spearpoint of social protest. As I said last week, many Filipinos—whether mistakenly or not—take Singapore’s enviable prosperity as the result of a pact with the devil of authoritarianism, a compromise between getting fed well and shutting up. So we’re glad to see Singaporean society loosening up and speaking out, and to meet the humans behind the industrial facade. Surely, we’d like to think, Singapore’s economic ascendancy and its emphatic claim to full modernization deserve to be crowned by a more liberal, compassionate, and inclusive democracy. A rich nation should be able to afford more, not less, freedom. Or so we thought. Very recently, Singapore’s government delivered another rude reminder of how deep in the dark cavern of the feudal mind its ministers remain, even as their citizens have begun to step out into the sunlight. 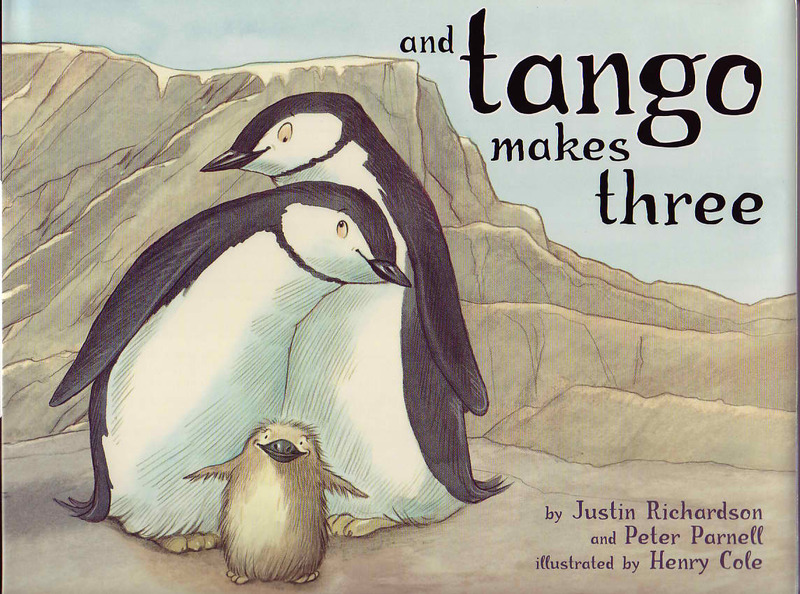 Reports say that the banned books include “And Tango Makes Three,” based on a true story about two male penguins that raised a baby penguin in a New York zoo. In “The White Swan Express,” children are adopted by straight, gay, mixed-race, and single parents. The third book, “Who’s In My Family,” includes gay couples among different types of families. Because a conservative parent complained about these books, an internal review was undertaken by the NLB, which then deemed them unsuitable and subject to removal and destruction. Not surprisingly, Singapore’s writers, artists, and academics—the liberal types every authoritarian regime fears and detests—are up in arms over the decision. Three prominent judges have resigned from the board of the biennial Singapore Literature Prize, and writers’ and gay organizations all over the world have denounced both the homophobia and the Hitlerite evocation of bookburning that the NLB action embodies. They point out, fairly enough, that conservatives who disagree with the books have a choice not to read them, but that others should have the option and opportunity to read them should they want to. “Lim, 65, was a single parent to her two sons and was also brought up in a single parent family for a time before her mother remarried. She said the removal of these books was a disappointment. “’In removing and pulping those books on various family structures, the National Library Board is telling these children that they and their families don’t count. In removing these books, NLB is reducing such children and their families into invisibility,’ she said. “The audience in the Chamber of the former Parliament House stood and applauded her words, including Hong Kong writer Nury Vittachi and Singapore writers Verena Tay and Josephine Chia. Also present was writer Felix Cheong, who along with fellow authors Gwee Li Sui, Adrian Tan and Prem Anand, withdrew from an NLB panel discussion last week, to protest against the withdrawal of the picture books. Had I been there, I would’ve stood up myself and cheered Suchen on, even at the risk of being blacklisted and turned away the next time I present myself at Changi’s immigration line. The fight against prejudice and censorship knows no national boundaries, which is why I’m writing up this issue for Filipino readers who couldn’t care less about Singapore and gay penguins. In truth, I’m a fairly frequent visitor to Singapore and have been the appreciative guest of both its government and of my fellow writers there. A couple of years ago, its tourism ministry took me, among other journalists, on a tour of Singapore’s cultural landmarks, including the National Library, and we were suitably impressed. 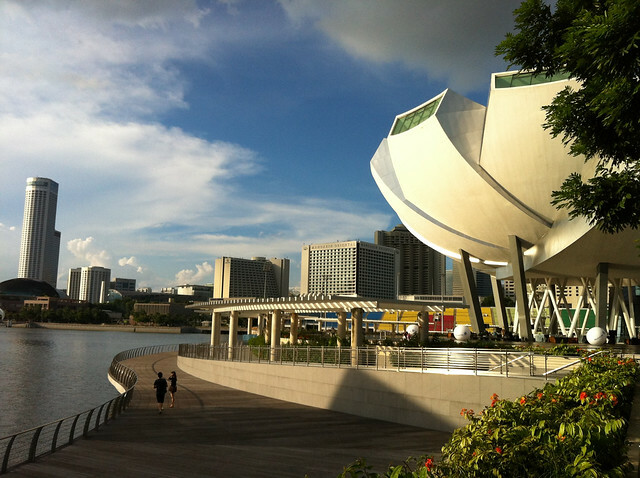 I wrote glowing reports about Singapore’s emergence as a new cultural hotspot in Asia. Why not? The view from The Hub—a glass bubble at the top of the library—was breathtaking, and I was moved by a special exhibit their ultramodern library had of their prominent writers’ memorabilia. When, I thought, would we come around to making these investments in books and culture in the Philippines? “Something went terribly wrong with Flor’s dream—whether through her fault or someone else’s, as now seems highly plausible, only God for the moment knows for certain. Two people died, allegedly by Flor’s maddened hand, and that was tragic enough. Today, Flor Contemplacion will die in turn in judicial payment for those lives—and that, too, will cause untold sorrow, especially among her people who have rallied to her defense. They were harsh words for a harsh situation, and even as I subsequently accepted and enjoyed, with not a little guilt, Singapore’s official hospitality, hoping that things had changed, I never quite lost the suspicion that beneath the First-World ease was a hair-trigger reflex that could be set off by any perceived threat to stability and security. A government that fears that the carefully constructed and presumably robust society it has built can be unraveled by the affection between two male penguins is exhibiting not just ignorance but paranoia. One has to wonder of what use it is to tout such 21st-century marvels as the Marina Bay Sands—and, yes, a state-of-the-art National Library—when the consciousness that directs the place is stuck somewhere in the 16th century. But before we Filipinos beat our chests and congratulate ourselves over how much more open we are to such modern concepts as tolerance and acceptance, let’s not forget that our own public officials share something with their Singaporean counterparts. When our President denied the accomplished actress but alleged drug user Nora Aunor the National Artist Award for fear that honoring her would encourage Filipinos to run out for their nearest dose of shabu, it showed that governments everywhere don’t have the foggiest idea of how art and artists work. But they do know that art works—much more effectively than government PR—and in that knowledge, perhaps, lies the source of their fear and disquietude. HAVING SOME fun with my Conway Stewart Marlborough and sepia ink that I mixed myself. IT SEEMS entirely fitting that I’m writing this review of a Singaporean novel practically on the eve of flying to Singapore for a writers’ conference. I’m actually meeting its author—Suchen Christine Lim—at that conference where she’ll be one of the keynote speakers, so I’m sure we’re going to have an interesting conversation at the kopi tiam. We Filipinos have generally looked at Singapore with an odd mixure of liberal disdain and a pauper’s envy. We like to imagine the typical Singaporean as an ideological robot who has to be programmed to have good clean fun, even as we shamelessly admire and imbibe Singapore’s First-World comforts on our occasional sorties through Changi’s Terminal 3 and down Orchard Road. We feel deeply conflicted by the fact that over 150,000 Filipinos work in Singapore, mainly as domestic helpers—proud of their tenacity and sacrifice, while being shamed by our inability to give them good jobs at home, with their families. This kind of duality, we soon learn, exists within Singaporean society as well. Singapore isn’t nearly as monolithic as we commonly think, and what it is today came about as a result of a complex, continuing, and often painful process, one that involves folding the past into the ever-changing present. 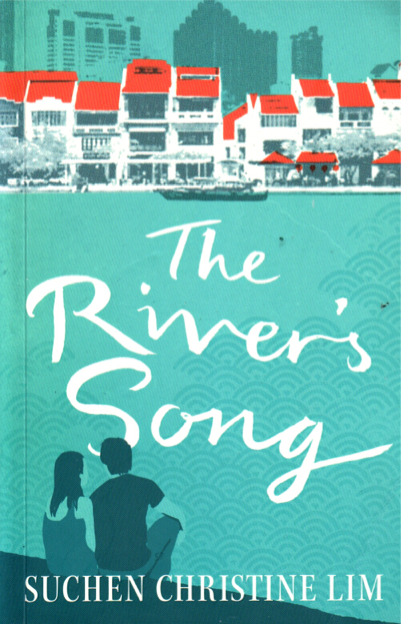 This is the narrative burden assumed by Suchen Christine Lim’s The River’s Song (UK: Aurora Metro, 2013). It’s a novel that sprawls over more than three decades and straddles Asia and North America, but its achievement lies less in its scope than in its intimacy, which is sustained throughout the work. There’s no great mystery or wizardry to Suchen’s technique: it’s solid storytelling, employing compelling and credible characters caught between being rich and poor, being young and old, being man and woman, and being loved and unloved. As with all good novels, The River’s Song is much more than the love story at its core, as satisfying as that already is. It’s a virtual chronicle of how modern Singapore came to be, and an accounting of the human and social costs of modernization, particularly at the fringes of society where every penny and every inch of land matters. Reflecting its author’s maturity and sensibility, it’s not the kind of angsty rant we tend to get from juvenile writers these days, but a poignant lament that holds out hope for redemption despite—to advert to a section heading—the darkness of the waters. Here and there, in a spot or two, I might quibble with Suchen over a note that may be slightly off-key; I suspect, for example, that the stray quotation from the Irish poet Seamus Heaney springs more from the author than from the character, whose musical artistry and intelligence I can’t contest, but whose literary inclinations had never been clearly established. Otherwise Suchen—one of Singapore’s most celebrated writers—has an impeccable gift for dialogue and scene-setting; the novel is practically a script, needing just a camera to become the movie its material seems cut out for. I spoke earlier of the stereotypes that we non-Singaporeans have of that place and its people. Suchen Lim banishes these stereotypes and much of our ignorance along with them. Of course there were poor and homeless Singaporeans. Of course there was principled resistance to the regime. Of course there’s a steamy underbelly to the façade of manicured lawn, polished glass, and hard-edged steel that contemporary Singapore projects. Those of us who visit and remark, perhaps too casually, about the “soullessness” of modern Singapore will have good cause to rethink that assumption; the soul may not be in Marina Bay Sands, but it’s clearly alive in the literary imagination. 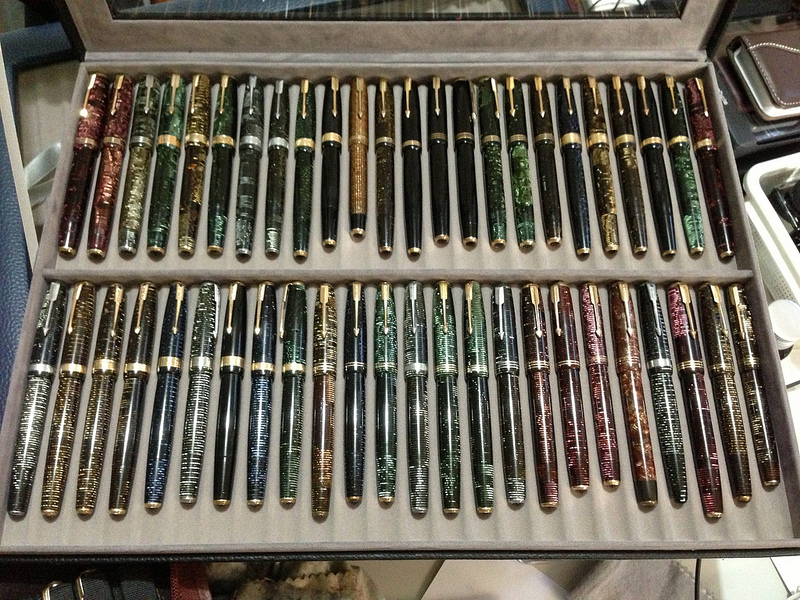 EVERY OTHER month or so, I take the 200+ contents of my fountain pen collection out of their wooden boxes and leather cases—a few of which reside in a fireproof safe—to ink, doodle with, clean, and reorganize. It’s a ritual that invariably leaves me pleased and at peace. Sometimes I reorganize the pens by age, sometimes by maker, sometimes by color or material. In the pen forums I inhabit, there’s a never-ending discussion about being either a “user” or a “collector,” the implication being that collectors are simply moneyed hoarders while users are simple, practical-minded folk who’ve never forgotten what things are for. I propose that the truth, as it often does, lies somewhere in between; many users are wannabe collectors, and most collectors have never stopped being users. It’s pointless to think of, say, a 1925 Waterman Sheraton or a 1934 Wahl Eversharp Doric as being just a pen you can write with, like a cheap ballpoint; they may have been utilitarian tools once, but somewhere along the way they crossed the line and became jewelry and art object. About 15 years ago it wasn’t pens but laptops—yes, Apple Macintosh Powerbooks, particularly the Duo line (the granddaddy of the MacBook Air and all those super-slim laptops people toss into their briefcases today). I had (and still have) about a dozen of these machines, which I used to take apart to upgrade the memory and hard drive (back when 240 megabytes made you king of the hill), before putting them back together again and then pressing the power button to hear that unmistakable startup chime that told me I had done everything right, so I could then step out and face the world and slay dragons and then sign memos. So why do otherwise presumably sane people like me get our kicks by amassing strange objects most other people wouldn’t give a second look or drag into their homes even if you paid them to do it? I asked myself this question again last week as I changed out the inks (another ritual for the devotee) in my glorified Bics. Why do we take them out week after week, not to write a novel or a draft SONA but endless iterations of “I love this pen I love this pen”? First of all, you want to be reassured that they’re still there. Collectibles have a way of walking away on little cat feet, and collectors have a sixth sense about what’s missing from the picture. Second, you want to reassure yourself that you know why they’re there—that the objects have some aesthetic and monetary value. Perhaps that value’s known only to a very few people, which is not a bad thing, because it’s proof of your connoisseurship, of a certain esoteric form of expertise that’s taken you some time and expense to cultivate. It’s like getting a PhD in the truly little, truly fun things (and what’s a PhD these days except a lot of knowledge about very small things, hardly any of which is fun?). You may be a total loser in nearly every other aspect of life—your face could resemble a well-worn shoe, your family may have deserted you for the coldest parts of Canada, your car could be an escapee from the junkyard—but if you know everything about tourbillons, carburetors, calibers, and (in my case) nibs, then you have good reason to face the world with pride if not arrogance; you have, after all, one of the world’s largest collection of GI Joes, or Tonkas, or Ken dolls, or whatever floats you boat. Since I’m sure I don’t collect Sheaffers and Esterbrooks to show off my power and wealth, let’s see what M. Farouk Radwan (who holds an M. Sc., so who presumably knows what he’s talking about) says about the subject: “Since early years human beings used to collect food in order to feel safe and secure. Because acquiring food was a difficult process with uncertain outcomes humans learned to ease their anxieties by storing the food they needed. The same need, which is to feel secure, is the primary motivating force behind the creation of collections. 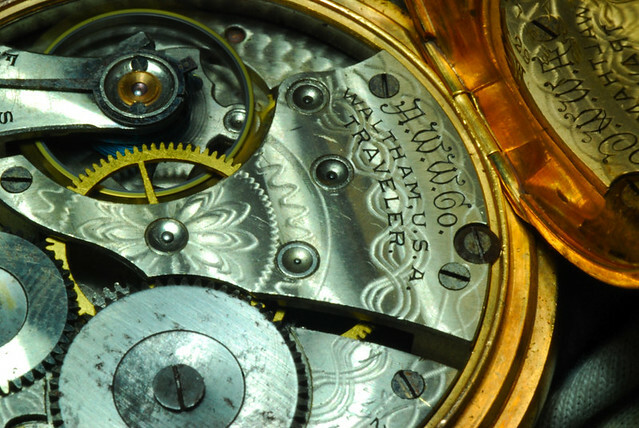 Patterns, designs, mismatches, aberrations: early in 1937, just for a few months, Parker came out with a special Vacumatic, with the word “Vacumatic” etched in the gold-filled cap band. 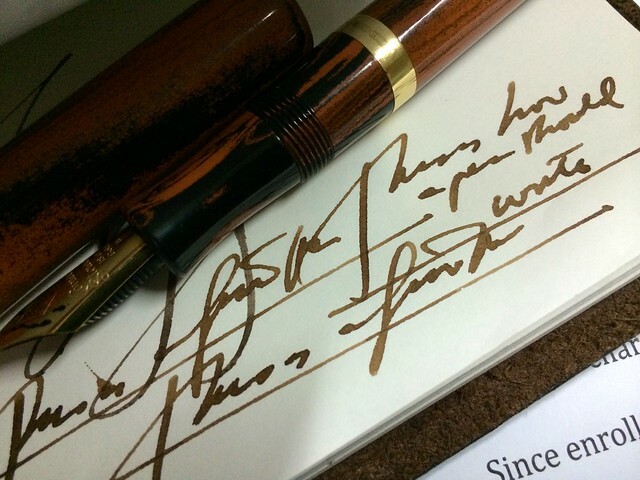 It’s one of the holy grails of Parker collectors, one of the rarest and most expensive of finds, and I have one. That should make it the crown jewel of my collection, but it isn’t; it’s the pen that made me write a story about it that’s the rarest one of all, that gives me a lifelong excuse for picking up tubes that squirt inks. IN MY other life as a dramatist, which came to an end some years ago, I wrote about a dozen plays for the stage and more than twice as many television plays and screenplays, mostly for the late Lino Brocka. Lino and I happily turned out double-hanky tearjerkers with such rousingly commercial titles (which someone presumably from the marketing department thought up) as Kailan Mahuhugasan ang Kasalanan, Ano ang Kulay ng Mukha ng Diyos, Maging Akin Ka Lamang, Miguelito, ang Batang Rebelde, and my very first one, back in 1977, Tahan Na, Empoy, Tahan. I may have stopped writing drama to focus on fiction and nonfiction, but now and then the old skills get a workout. I’ve always said that there’s no better training for a writer of fiction than to have been a playwright, because playwriting teaches dramatic economy—how to set up a scene, how to get the most out of your characters, how to use dialogue effectively (meaning, at its most complex, how to get your characters to say things they don’t mean, or to mean things they can’t say). Last week, I said as much again to a group of writers and program analysts from a TV network who wanted to see how writers think. I told them that drama’s to be found not only in filmscripts or on the set—it’s all around us, taking place quietly in some fastfood joint or some bus stop or some hospital ward; the writer’s task is to see that drama, to palpate it from the tedium of everyday life, and to sharpen and brighten its edges so others can see the extraordinary in otherwise ordinary moments. Case in point Number 2: Sometimes silence is drama; when your wife refuses to explain why she doesn’t want to talk to you, that’s drama. When the Palace refuses to explain why it dropped Nora Aunor from the list of National Artist awardees, that’s drama. All President Noynoy’s spokesmen could say was “It’s the President’s prerogative….”, which is exactly what we heard from President Gloria’s spokesmen a few years ago, the only difference being that she made dagdag, while Noynoy made bawas. I did read something about Nora’s exclusion being “in the national interest,” but it boggles the mind to figure out exactly what that means. I can understand defending the Spratlys and Scarborough Shoal as being “in the national interest”; I can even understand rooting for Manny Pacquiao on fight day—temporarily setting all his other quirks and antics aside—as being “in the national interest.” But dropping Nora? As I wrote in this corner a few months ago, I was on a large, multidisciplinary, second-level committee that endorsed Nora Aunor to a higher body (the NCCA and CCP Boards plus the National Artists); we endorsed Dolphy as well, and if I remember right, he and Nora got the same highest votes across the board. Granted that our recommendations were just that and subject to final approval upstairs, I feel among many others in the arts that we at least deserve a full and cogent explanation for all these pluses and minuses that take place in Malacañang. The Palace—and I don’t mean just the present occupant—has never been known to be a bulwark of artistic support and sensibility, if you look at funding for the arts in relation to everything else; if it never cared for or about the arts, why should it suddenly care—negatively at that—about Nora Aunor, whom the arts community clearly feels is deserving of its highest accolade? If you can’t help, at least don’t get in the way. I’d been told by some Palace contacts that questions came up about Nora’s alleged drug use. OK, I said, it’s fair enough to raise these questions which presumably involve moral turpitude. But since when has it been fair to use morality as a standard for artistic excellence? We’ve had National Artists whose personal lives were hardly spotless, but whose art precisely may have been deepened and enriched by those encounters with their darker side. (Conversely, we’ve had National Artists who may present themselves as moral exemplars and accuse everyone else of some fatal shortcoming, but whose work is unremittingly mediocre and soporific.) Edgar Allan Poe, Salvador Dali, Jean-Michel Basquiat, and Miles Davis, among many others, would never qualify for state honors in their countries (not that they ever cared) if our Malacañang’s standards were employed. Last case in point: I wholeheartedly agreed with the NCCA when it protested the Palace snub of Ms. Aunor, but also wholeheartedly disagreed with the NCCA when it reportedly protested allowing the use of our national heroes’ names for such popular products as beer. (Think “Cerveza Rizal” or “Mabini Beer.”) The reason given by objectors was that it would be a sign of disrespect for these heroes to associate something as morally undesirable as alcohol with them. Really? Which planet are we on? Didn’t our heroes drink beer and stiffer forms of alcohol—in spite (or dare I say because) of which they performed heroic deeds, anyway? Rizal complained that his fellow ilustrados in Spain drank and womanized too much, but that hardly meant that he was completely abstemious in either department. He didn’t care much for hard liquor, but drank beer (like me, on whom single malt would be a total waste). George Washington was a beer guy as well, and even famously left a handwritten recipe for his own brew (later marketed in an “Ales of the Revolution” line). So will the moral police please lighten up? If Nora’s good enough to be a National Artist, then Jose Rizal should be good enough to go on a beer bottle, and I’ll hoist many a cold Rizal in his own honor. Heroes aren’t heroes because they’re perfect human beings; they’re heroes because—despite some truly terrible character flaws and peccadilloes (one of them even shot his wife, remember? )—they left something indelible to the national spirit and imagination, enough for us to think of ourselves as a nation. Heroes and National Artists (the real ones and the best ones) can do that; politicians—whether in prison or in the Palace—can’t.